Maryland Governor Martin O'Malley and former Governor Robert Ehrlich met face-to-face for the first time since their campaigns kicked off. The two were in Baltimore, Md., for a taped debate, focusing on jobs, education and the negative ads the candidates have aimed at each other. Supporters of Governor 'O'Malley demonstrated in front of the Baltimore TV station where the debate was held. Members of the audience included Democratic elected officials, Sen. Barbara Mikulski among them. The campaign team for Bob Ehrlich said the rules called for a non-partisan debate crowd. Chris Gordon reports on the first debate between Maryland's current and former governors in the race for the governor's chair. The debate began with the economy and the need to create jobs. Governor O'Malley said, "The truth is we created 33,000 new jobs. That's according to the Bureau of Labor Statistics. We have a deep hole to climb out of." 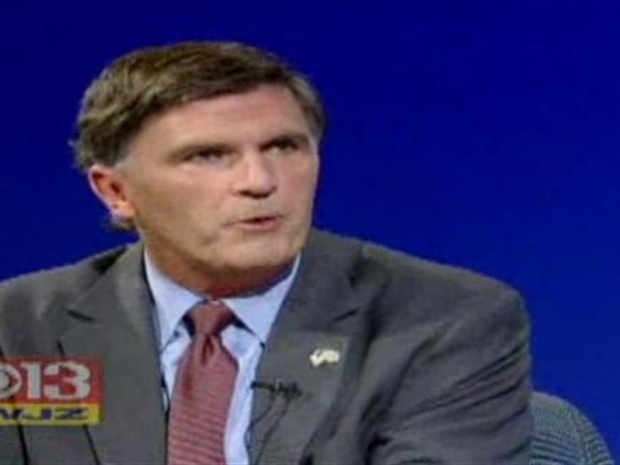 Republican Bob Ehrlich attacked O'Malley's record, calling him "Gov" several times. "Gov, you said you cut state spending. But I added up your spending over the past four years. It's $124 billion. As governor I spent $101 billion. That's not just a 'rounding' error," Ehrlich said. "That's big money." The debate turned personal at times, with emotions coming close to the surface. Ehrlich pointed to O'Malley's TV ads. "As a result of your negative ads I came from 10 points behind to even, but the worst was when you blamed me for the Louisiana oil spill," he said. O'Malley tried to interject that he was not blaming Ehrlich for the spill, but Ehrlich cut him off, saying, "This is my time." The Governor and former Governor will hold public forums and debate on radio and TV several times in the next few weeks. The next official debate will be in our area, sponsored by the Washington Post, on Thursday afternoon.